Do you dream of vacationing in an elegant private villa on Capri, with a stunning view over the Faraglioni and just a short stroll to the chic Piazzetta? Make your dream come true at Villa Carola! 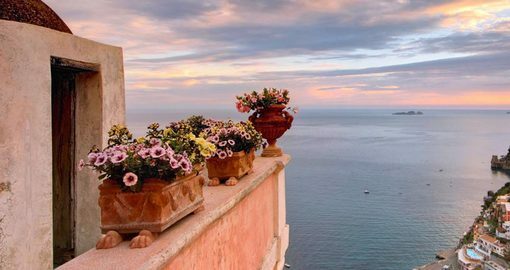 Surrounded by a full 350 square meters of lush Mediterranean garden, the villa is located on an exclusive hillside overlooking Marina Piccola and the dramatic Faraglioni sea stacks. The entrance to the villa is just 300 meters from the main road between Marina Piccola and Capri town, and guests can reach the center of town on foot in just 15 minutes. 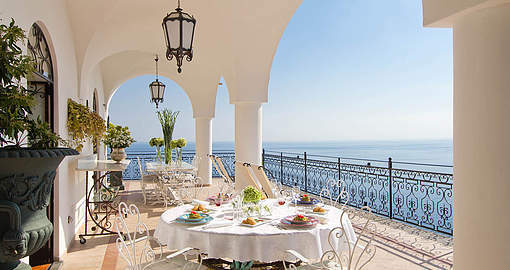 The villa boasts three large terraces, all with breathtaking sea views. Stroll through the villa's entrance hall to the first terrace, and you will be struck by the dramatic view directly over Capri's famous Faraglioni. Shaded by towering Mediterranean pines, this is the perfect spot for breakfast each morning at the outdoor dining set, or to simply unwind on the comfortable armchairs. Guests can reach the second terrace at Villa Carola by taking a flight of stairs from the garden, or from the master bedroom. This terrace is where the elegant travertine marble pool is located, surrounded by a sundeck with loungers, deck chairs, sun umbrellas, and tables. There is also a changing room and shower adjacent. Take a walk from the pool to the lemon grove and through the gate to the road leading down to the Marina Piccola beach. With its understated elegance, crisp white and blue color palette, floors in handpainted majolica tiles from Vietri, and spacious, sun-washed rooms, Villa Carola is the epitome of classic island style. From the large picture windows in the main living room with a fireplace, guests can admire the gorgeous view of the Mediterranean and the towering Faraglioni sea stacks...truly breathtaking! The bedrooms, kitchen, and bathrooms in Villa Carola were recently renovated and offer all the modern comforts guests need for a flawless stay. The villa is on two levels: on the upper level there are two double bedrooms and two bathrooms; on the lower level there is a master bedroom with private bath that has direct access onto the terrace with a pool. 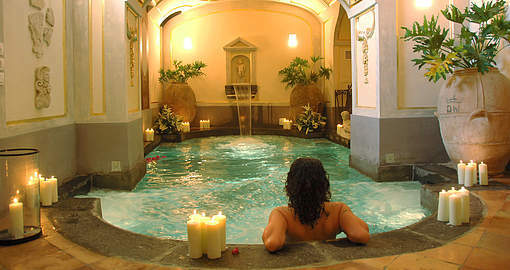 We will be happy to assist you during each stage of your luxury villa rental experience in Italy.